Pricing starts at $30/month for a team of 5. Contact Quip for a quote. Pros: It's super easy to start using and is great for shared documents where you need to have multiple people providing input and updates. I like that two people can be simultaneously working on a document without a problem. Cons: My annoyances with this software stem from the features - what is there and what is not there. One of my biggest gripes is that Quip believes it is "distracting and not necessary" (their words) to have the option of changing the color of the text. I disagree. As a business professional for the past 25 years, I can tell you there are instances where you need to color code text. I recently had a huge, very collaborative project that I wanted to base out of Quip and THE ONLY REASON I couldn't use Quip was because it had to be color coded and Quip doesn't do that. I've tried appealing to them but so far, no luck. Yet, one apparently "necessary" feature is that you can add an emoji or animated meme to your comments within a document. Really? And that is more important for business communications? I'm guessing this software is being created by a bunch of millennials. I don't begrudge millenials or the "fun" elements that are included, but give me the useful business functionality we have all become accustomed to over the past couple of decades if you truly want to compete for our word processing and spreadsheet needs. Pros: 1. I love quip as its the only good version controlled platform for taking notes that I have found in my industry experience of over 5 years. Cons: 1. It behaves odd when creating tables and adding pictures (like indentation sometimes screws up). Overall: We use quip to track our updates, design documents etc and it has proven to be a really powerful platform for the same. Pros: Simple user interface and easy to onboard my employees. Quip keeps us very organized and is great for tagging each other in comments and collaborating in single documents. They have a number of workflow features that we've used several times to help manage project timelines, etc. I also love that I can share links to documents so clients can pop in and review without having to be added as a full user. We've reached out to customer support several times, especially during the onboarding process, and they have always been extremely helpful. Cons: Notifications are a little overwhelming and difficult to manage. Very rarely we've had issues with pages not updating or saving, especially when there is a lot of text that has been copy/pasted. Overall: I would highly recommend Quip to any team needing to collaborate on a lot of documents. It keeps us extremely organized, we love the workflow features, and communication tools. We have tried using Google Drive in the past and have STRUGGLED with the shotty navigation and lack of tagging/communication options. Quip is exponentially better than any other docu-sharing tool we've used! Pros: I use quip mainly to organize my work and collaborate with my team members in documenting feature requirements. Product feature requirements are dynamic - in that, they change often. The ability to have one central location from where all of us can access it makes this a huge time saver for all. It also prevents unnecessary emails as users can chat / comment directly on quip. It also has the ability to create private folders which I use to store work in progress ideas and the ability to restrict access to some files / folders to specific people. Cons: Quip requires the internet and often I forget that I have to be connected to save changes. Although it has the ability to add spreadsheets, I don't use it much. Also, have noticed when I copy paste code into code-blocks, the pasted content does not fit within the default page-width, but creates a horizontal scroll-bar within the code-block. It's a bit of an irritant to correct that every time. Overall: Productivity, Collaboration, Central repository. Pros: So easy to collaboration with colleagues, and for family. Get everything together rather than individual files everywhere. "Word", "Excel", "Powerpoint" lite versions, so easy to use, whatever you want. With google account integration. No hassle for account management. You certainly don't expect it to be super powerful, but it is good enough for our purpose. Cons: Logic of files arrangement a bit confusing. If you are coming from traditional file system. You may need sometime to get used to it. Moving files around is not that easy, especially if you want to manage multiple files at the same time. It used to be annoying that recent editing panel shows up every time you open the application. Recent updates fix this problem. Overall: To be simple, we really like this easy to use collaboration tool. Pros: No doubt power and facilitates collective work, the platform has a nice appearance that allows easy recognition of your commands and functions, in general it is easy to use by any team to create and edit documents, slides, spreadsheets and initiate direct chat with your team, the most favorable point is that you can do all that while staying on the same platform. Cons: It is flexible and dynamic but it does have elements that must be adjusted and improved to strengthen the relationship and interaction with the user so that he or she can personalize their work environment and adapt it to the needs of the company and the department that uses it. Overall: Its environment and interface allow to have an experience that counts as an important factor to select it as a necessary software within the work environment, allows it to be integrated with other complementary platforms and that generates a greater scope of its capabilities. Pros: I like the version control quality which Quip affords me and how I can restore previous versions of any document,if someone makes a mistake on the updated version.It is easily accessible as I get to use it on my mobile phones and laptop. Cons: The user interface is not intuitive for me and I encounter issues navigating around this program.I also experiencing obstacles opening the web page from my mobile app. Overall: In my organization,I get to work with multiple people from different locations.Quip provides me with a single platform via which I can collaborate with everyone ,and monitor what everyone is doing : instead of spending hours sorting through torns of email threads. Pros: It's very easy to collaborate on a document. You just add people to it. All the changes are logged so you can see all the things that happen to your document. You can also create all kinds of documents on Quip, from the everyday text document and spreadsheet to the specific kanban board and project tracker (with a little help from Live apps). Cons: The app lacks the ability to add tags - which will be very helpful to further organize the documents. It also doesn't hurt to add the font-customization feature so that users can set the look and feel of the working environment to their liking. Pros: VERY intuitive interface. My staff is resistant to change, and they picked up on this software immediately. Looks good on the web, great on my desktop, and awesome on my phone! Cons: Very minor detail here - more of a feature enhancement request. It would be great to tie in some sort of task management, e.g. something with due dates that alert you. Overall: I have a small staff who needs to work together at various times, and usually not in person. We've tried a handful of options (dreaded e-mail chains, Google drive, slack, OneNote, Trello), with varying degrees of success. Recommendations to other buyers: Try it. Definitely something the more you use (give it two days), the more you appreciate it and how well it fits. Pros: Very easy document creation that live updates to all users as you create them. No more messing around uploading and downloading documents. Pros: I love how Quip allows you to create both shared and private documents. The language feature is really great (i.e. it is completely functional in Spanish). The folder system is really helpful and is easy to be organized, even with different groups. You can comment on the documents, tag people, and even comment on photos. All changes are tracked. Cons: Once we got to be a much bigger group, it became less functional because you cannot directly access Google Suite with it. We needed to expand more, and Quip didn't allow for that. Pros: Continuing improvement in the feature set. The software was good when we started using it 2.5 years ago. However, the improvements continually made month after month have really made the product shine. We really get use out of the full index/searching capability. Cons: A few basic things that would mimmic Excel functionality, like the ability to freeze columns on mobile, or hide rows/columns on both the desktop and mobile. Overall: We have rolled Quip out to multiple departments and teams over the past few years. Comments: Quip is a great addition for any company with its easy to use style of collaboration and flexibility in security and structure. I'd like to see a lot more training videos on how to leverage Quip for things like Project Management to plant those seeds and help companies grow and realize the full potential of this application. 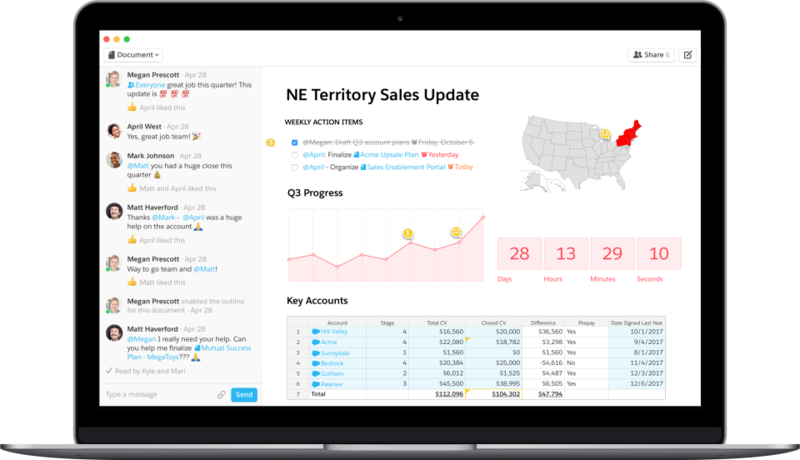 Pros: Salesforce recently added Quip to it's suite of products and we couldn't be happier. We have been searching for a project management application as well as a solution for sharing documents and data while not housing inside our Salesforce org, due to storage limitations. We see Quip as being that all in one application that can solve many of these needs in our organization. It is powerful, flexible, offers free and paid apps like a project management app and allows for flexibility with security of files and folders. Not to mention the live chat and collaboration features it offers. 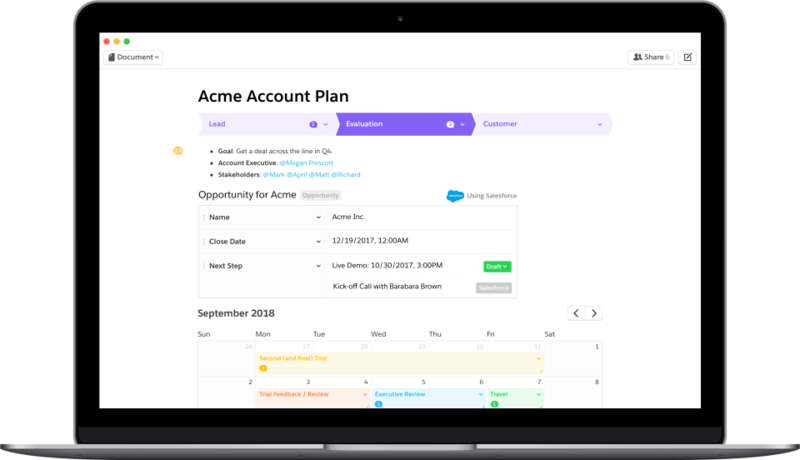 A great all around solution for anything you can't already solve in your standard Salesforce Org. Cons: I have requested several specific demos from our sales team so that we can more fully realize what Quip can do to meet some of our more basic needs. We've been given links to sales demos which don't address our specific needs. Once we get an idea on what we can do with it and how, it will drive more ideas and creativity for our team, we're just having a hard time getting started. Pros: We really like Quip the way it is built as the platform itself acts as a source to maintiain all the tools like docs, chat etc. in this single app itself. Quip is the best way to manage all the different tabs under one window. The major hike is with the single window system where all the needed plugins are added and can be managed. Quip is the one and only platform to simplify the user burden of maintaining multiple apps and multiple windows. Cons: The UI is very hard to understand at the first time and for newcomers. Overall: We have increased the productivity of our employees and thus our core goal of high productivity is achieved. Pros: Quip enable me collaborate on documents in real time with my colleagues.Unlike other document collaboration programs,I am able to chat in real time with my fellow collaborators about the document we are collaborating on. Cons: While I am able to edit documents by myself offline.To collaboratively edit documents,I have to be online and this requires a stable internet connection. Pros: Quip is a great tool to use for collaborative work. Often times, my team would have to share multiple versions of the same spreadsheet, but with Quip, you can see real-time updates from colleagues and communicate all within the app. Cons: While it is great for collaboration, the tool becomes glitchy when it contains a large amount of data. There have been instances of lost work due to inability to save changes. If you are working with large spreadsheets with multiple tabs, it could become too much for the tool to handle. Overall: In my experience, I've really enjoyed using Quip to easily house documents and spreadsheets with a friendly and easy to use interface. Comments: Quip provides unique ability to create, edit and share highly customized documents/spreadsheets. 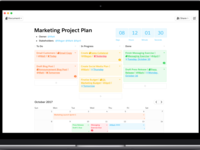 Quip doesn't have a structure to follow for project management, so it requires a lot of upfront time commitment and development. However, after creating the needed documents and templates, it is the perfect tool. Specifically, great to use for mind-mapping, checklists, embedded spreadsheets/tracking. Recommendations to other buyers: Give it a try, it is well worth the money and provides flexibility for a whole range of projects and tasks. Pros: Quip does a great job at being a very easy-to-use app when it comes to having collaborative documents to share for work. I like how different team members can contribute and leave their input simultaneously with other coworkers. Cons: The new UI makes things and tools hard to find. With an extremely clean look where the color white is so predominant, buttons are difficult to see and getting your work done may be more difficult. Pros: I like the commenting and accessibility features. I also appreciate the organization of the software. It makes it easy to use and navigate. Cons: I feel like the app could use some updating to make it more mobile friendly. I also wish there could be more editing ability in Quip. Pros: Ease of use. It's "stupid easy" to invite people to collaborate on a document. Comments are a breeze. Paragraphs auto-lock when you are editing them to avoid confusion. You can track your team members usage. Cons: I wish that reviewing, version control, and security were stronger. Overall: Quip is my team's go to utility for writing documents together. Google Docs is probably one of the most well known cloud based document editors that facilitates collaboration between team members. However, its collaborative elements always seemed tacked on. You can tell that Quip was built to be a team writing tool from the ground up. Recommendations to other buyers: Try it out! It's so easy. This might not be the tool of choice for a large org with very detailed processes, but it is probably perfect for your team to get together (online) to write something. Pros: Quip allows you to try their platform for free as long as you need, so you can really figure out whether or not it works for your team before you invest in the paid version. Compared to other products that have a time-limited free trial, Quip offers a much better evaluation period. Cons: The ability to upload images and PDFs is limited at best. It's easier to upload a photo album on Facebook and share it with your team than it is to do the same thing in Quip. Great for text based documents, however. Pros: I like how you can add a spreadsheet or a check list to a document. It's very customizable and the functionality to create it all is easy to use. Cons: Creating a spreadsheet into Quip is not the best. I feel like there is always a delay or a "lag" when editing or dragging cells. It's not the best option to use when creating a spreadsheet. Might stick to Excel for that part. Comments: The big takeaway is that Quip uniquely enables you and your colleagues to create a multi-asset document in one place, together. Pros: Quip enables users to build a rich, multimedia, and multi-asset document in one location. 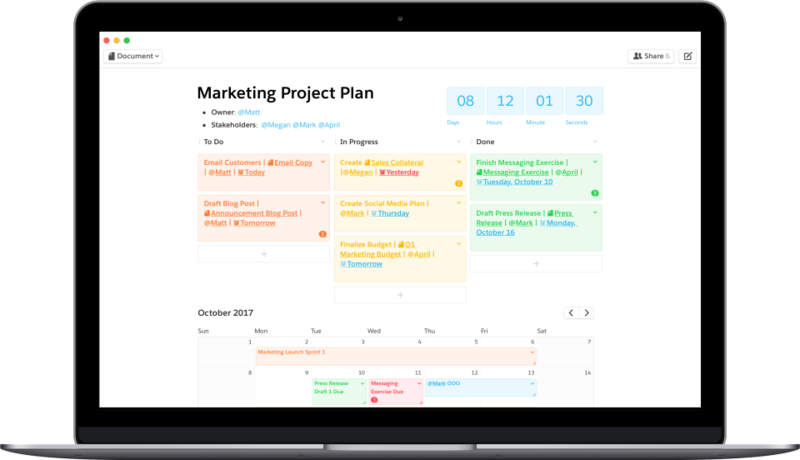 Do you need to create a document that includes a calendar, spreadsheet, and kanban board all in the same place? Quip can do that. Cons: While the interface has improved recently, it is still a little difficult to navigate from your document to the folder in which it is contained. Also, Quip could make better use of icons for identifying content types. Pros: Group chats and file sharing are a lifesaver. No one likes group texts, they're annoying and don't carry over well between mobile platforms. With Quip, we can share a group chat that isn't annoying. File sharing helps when people are out of the office. We're always on the go and being able to send things back and forth without it getting lost in email is wonderful. Getting everyone together for meetings is almost always impossible with our crazy schedules and we never manage to pass the info around to everyone. This way we can send it out to everyone and know it was received. The to-do list function helps keep me organized. Cons: The price. At some point you start wondering is it really worth the price of every additional app and software you need. We have 20 something people, that adds up real quick. Much more cost effective for a smaller team. Pros: It's amazing for work with other people, in teams, project, or even to do your own work and save it there, make schedules, organize with your people or even make to do lists. Cons: Sometimes some features are lost because you don't find where to use those. Overall: Pretty great, it's very helpful and I use everyday at work because of his facility and is very quick to use. Pros: Quip provides you to create many kinds of documents under one roof. Not only text document, but also everything else from spreadsheets to presentation slides, and more. It also supports collaboration with others. Cons: It requires more than one step just to access your folders. It might be a design decision, but it's not a friendly one. Comments: But I think quip is still deserve a 4star review. 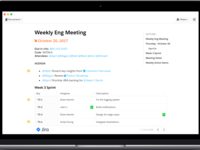 Pros: Our team use quip software as our project management because we can interact in quip from real time and we can also send a documents using this software. Cons: It is not totally easy to use, you need a knowledge using this before you make it work fine and I think it still lack of some features. I built a custom reporting tool without being a programmer. Pros: The interface is clean and user-friendly. A novice can create a robust reporting tool for your internal use in less than a week. Cons: The embedded spreadsheet application has many advanced features. The Quip spreadsheet has more bells and whistles than I could figure out in one sitting. Quip's tutorals and customer service staff guided and coached me through the rough spots. Overall: I was up to produce a highly functional spreadsheet to use as a reporting tool for my upstream management. Overall: Using Quip for creating documents within the team, talk about it and use the chat instead of sending emails back and forth. This is such a time saver. Quip works great at first..
Pros: Quip is free/inexpensive. And it's easy to add people, so collaboration is a breeze. Cons: When too many projects are added to Quip, it gets quite confusing. Especially if you have different users with different access levels. Suddenly you have 3 folders with nearly identical content, and you never know which one to update. Overall: We're still using Quip. But if you're not careful to make sure it's well organized, there can be communication problems. Comments: It was honestly one of the better experiences I've had getting a team set up on a platform they'd never used. Seems good for the not-so-techie folks out there. Pros: So. Easy. To. Use. Quip helped a remote team get organized, share and store marketing materials, research and other company data. Cons: We ran into issues with some of the documents we wanted to create, because the formatting options in Quip are extremely spartan. Pros: Simplicity, easy to use. Export to PDF is a function we use a lot. Also a big fan of the various keyboard short cuts. Cons: Customizing text and some docs. Would love a few additional templates...but no huge complaints that hinder our productivity. Pros: Beautiful design. Incredibly easy to use. Love it all. Overall: A Beautiful and easy-to-use app that makes it easy to take notes, collaborate on documents, and keep all of my work in one place. Quip is indispensable to my day-to-day. Recommendations to other buyers: Looking forward to seeing how Salesforce integrates Quip into their platform! 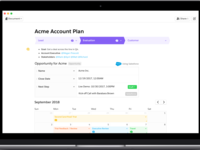 Pros: What I enjoy most about this tool is the ability to pull information from Salesforce to help with planning. It allows me to create lovely collaborative documents with live information from Salesforce. This makes the project standup quick and easy. Cons: I have a very nitpicky con but as a daily excel user, I wish the spreadsheet functions had an easier to use interface. It feels hard to do easy things like changing the format of a column. 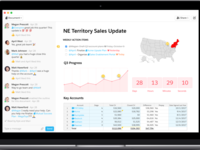 Overall: If you use Salesforce it is a no-brainer to get Quip. It makes acting on data from your Org quick and easy without having to flip between multiple applications or windows. Pros: Great features that allow for collaboration and communication across documents. Cons: When the documents or content within a document becomes extensive, it isn't as easy to navigate to a specific piece of content. Especially if someone has named you in the document--no intuitive way to search document. I'm sure there is a way, but it isn't obvious, and that's my point of contention. Pros: Quip is a program that contains a large number of functions. All the necessary information for work can be stored in the cloud of service, and all employees can find the necessary document themselves. With Quip you can communicate with employees in live chat, also you can create and edit documents together. I really like the role settings feature. Since we have many employees in our team, not all of them have full access to all documents in the cloud; I can easily set priorities and visibility of documents for different users. Cons: Unfortunately, when I open a document or read a large number of messages in a chat, the mobile application of the program runs slowly. In the rest, simply perfect service. Pros: Quip is a very slick real-time document management platform. For remote teams, it's a very capable way to coordinate and edit documents for a wide variety of use cases. I especially like the user management features for bringing in collaborators and other outside partners to work on particular documents. Not only that, but Quip is super flexible, and even integrates into various CRM platforms for even greater capabilities. Cons: Quip is great, but given the competitors out there, it's a little expensive. This is the one thing I would change about Quip. Overall: Real-time, flexible, and comprehensive document management. 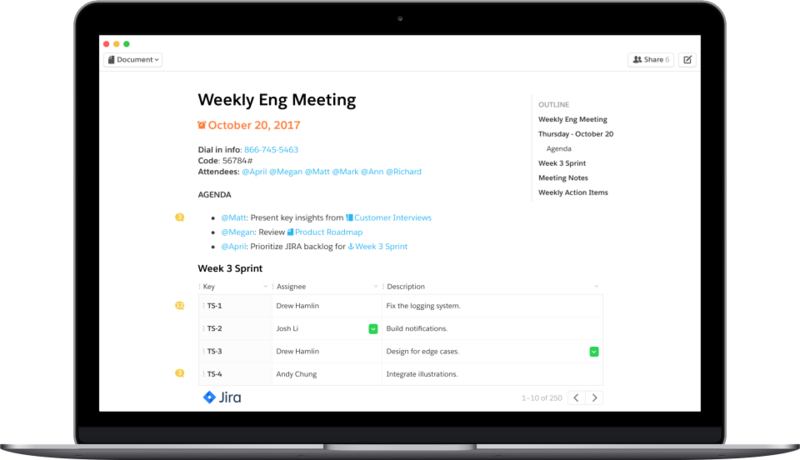 Quip is a great solution for remote teams and collaborators for all kinds of projects and workflows. Pros: Easy understanding of the documents and possibilities. Amazing chat and share functions with comments in every document. 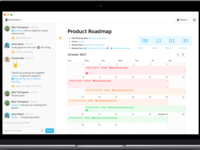 Overall: Just one of the best tools to organize your work, share with co-workers and improve your creation and development. Quip is a great tool to create and edit documents online. 2. Shared spreadsheets are incredibly functional and helpful. 3. Keyboard shortcuts are amazing. 4. Beautiful UI design and user friendly. 5. Import export functionalities are really good. Cons: 1. No Task delegation features. 2. Sometimes a little slow. 4. A little less mobile friendly. Pros: Very modern looking. Everything is where you'd expect it to be, and when used correctly, this software can greatly improve communication between departments and coworkers in your company. Overall: I've spent a lot of time navigating the endless world of Google productivity tools and at times I'm met with more frustration than productivity, mostly related to scale and having a large number of contributors. Quip makes that easy with a sleek canvas feel and an easy-on-the-eyes way of organizing. Sometimes less is more and I've found that simple has boosted productivity for myself and my teams and collaboration is at an all-time high. The one drawback I have is somewhat of a challenge: when collaboration and comments spike there should be a better way to filter through the noise, as it can get a bit stifling keeping track of all the conversations. Thread/forum type implementation perhaps? Comments: Quip is Perfect for small team, if your team need on time word or excel collaboration, the UI is beautiful and easy for use, and for small teams, it's totally free. Pros: Best choice for word collaboration. Recommendations to other buyers: Should not miss this SAAS, if you need online doc collaboration. Overall: Quip is a nice way to work on documents in a team, but some important features are still missing. It's pretty easy to create folders, documents and edit them in a team but tracking the overall status is complicated. You can create task-lists but there is no connection to the real documents so tracking progress is rather complicated. Functionalities to set the document status, assign it to team member and tracking progress would be a big plus. Pros: I love that they mail the new battery and brush head to me every 3 months, so easy to keep up with and make sure that I have a clean, functioning toothbrush. Cons: The toothbrush head is sometimes hard to pull off, but not too bad. Once I figured it out it was pretty easy to do. Pros: The checklisting ability in text is brilliant and helps me to write effective checklists which I can later tick off and check I have done visually. Cons: Formatting spreadsheets within pages can be quite painful. It doesn't resize correctly and you can often spend a lot of time fighting the formatting. Pros: You are able to collaborate with your coworkers and view and edit documents and slides without having to be in the same room. I also like the chat feature and that you can tell when someone is online or if they edit the document. Cons: I do not have a complaint with quip at all it is a great software I highly recommend it. 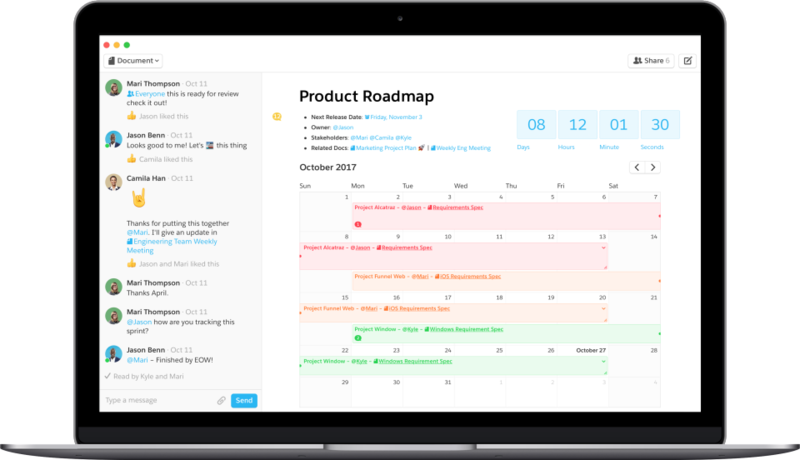 Pros: Quip has great integration, it's a great platform for project management and customer service is great. Cons: It doesn't have enough security from my point of view. The desktop app has no security at all and I think that they should change the way information within the app is accessed. Comments: I use Quip every day for creating technical design documents and managing my team's backlog of tasks. The offline support is great.